I ran through the forest, desperately searching for the one who I had been told would speak with me. The sounds of pursuit behind me faded away as I ran further and further into the gloom, but I knew that those behind me would find me again, if the creatures in this forest didn’t get me first. I could already hear the rustles and soft vocalizations of the animals lurking in the shadows and knew that I didn’t have much time. Where was he? And then I heard the brush rustle behind me and knew I was out of time. I spun around, clutching the dagger in my hand in a futile attempt at protection against the danger approaching. And then out of the shadows stepped a beautiful wolf with fur the color of the night sky and a powerful presence that demanded compliance. “You smell familiar, human,” The voice was deep and rumbling. “Ah, the first listener. SlyOkami, that I am.” The wolf stepped forward. “And how might I be of assistance, human?” The wolf’s jaws opened, revealing sharp teeth, and his tongue lolled out in a way that should have reminded me of my dog, but instead just felt threatening. “I have questions I was hoping you could answer.” I asked, taking a step away as the wolf began to prowl around me. 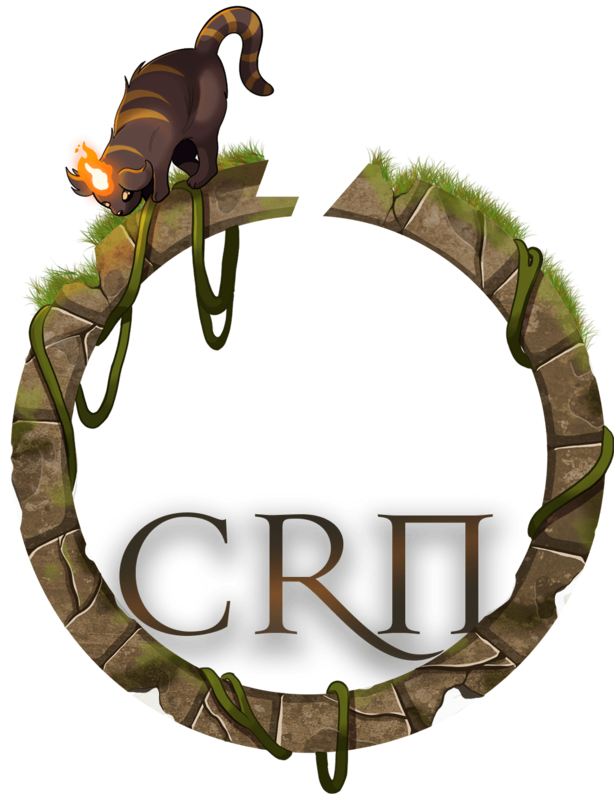 Grandia, of CrN’s marketing team, sat down with SlyOkami at the completion of his original novel, The Dragon Within, to glean some pearls of wisdom. Don’t forget to read the novel here. You can also support SlyOkami here. 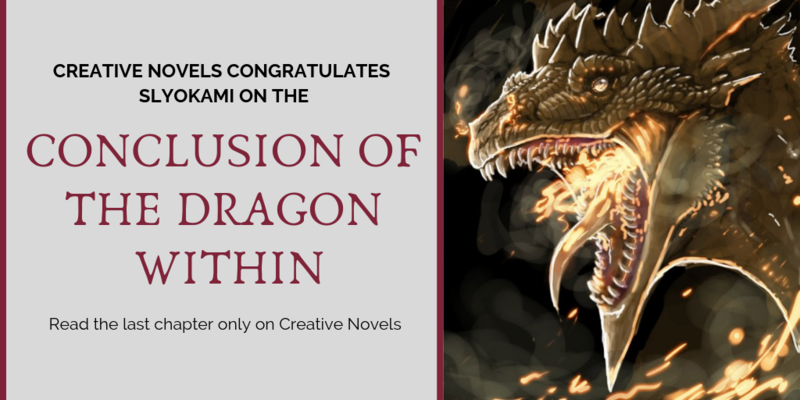 Congratulations on finishing The Dragon Within. How does it feel to be done? It feels fulfilling, after so many previous ideas abandoned, it feels like an accomplishment to not only having finished it but ended it on the right note I wanted! What’s one thing you’ve learned while writing it? I’ve learned many things throughout the adventure that was writing The Dragon Within, but I’d say the one I hold closest to heart is this: Do not force romance, if it doesn’t feel like a natural flow to you, then it won’t to your readers either. Any advice to give on finishing a novel to other writers? Know when to end it, long stories can not only grow dreary to read but also write. I learned this the hard way with two of my previous novels. If the ending feels right, and you’ve gone through everything you wanted to go through, then it’s time to tie up bonds and clean up unfinished ends. What are your plans now that you’re done? Has anything changed about the way you think about writing/TDW from when you started it to now that you’re done? I used to write stories with bittersweet endings because that’s just how my life has been, but mid-way through I realised my writing doesn’t have to be bittersweet. Not if I wish it to be otherwise. I realised, I control the pen, and not the other way around. In a world so grey as the one we live in nowadays, I’ve always wanted something to spew my imagination onto. Then a friend once upon a time, introduced me to a fiction writing website, giving me several good reads albeit not quite there in quality. This inspired me to try, it inspired me to put my swelling imagination into words and so I did. It is not a singular person or thing that inspires me to write, but the idea of it. I know that one thing a lot of writers struggle with is writer’s block. Do you have any advice for them? What’s something about writing that makes you really excited? The moment I am done writing, done editing and press that holy ‘post’ button. I am obsessed with reading what my readers think of it, even if they dislike it, I absolutely love reading and responding to feedback! When I looked up, the night sky was full of stars but no moon, and I knew…I knew the final clash was to come! Such thoughtful answers! Thank you! One last question: is there something you’d like to say to your readers? Thank you, is what I always say at the end of each of my novels, and I cannot even begin to explain how much more that means to me. I remember every time I would finish reading a story, I remember the emotions those stories burned into me. I only hope my stories made your worlds just a tad bit brighter, as you reading them has done to mine.  Thanks so much for making CrN a better place by sharing your story with us! We look forward to many more amazing novels with you. Readers, if you have something to say to your favorite author, please comment down below. And of course, if you have any questions for him, comment and who knows, maybe he’ll give you a reply?